More and more business owners are finding that vehicle wraps are extremely cost-effective in terms of advertising dollars. It is estimated that a vehicle wrap can generate 30,000-60,000 impressions a day. Since most vehicle wraps last between three to five years, cost per impression won't even be enough to talk about. We're talking a tiny fraction of a penny! Whether you're looking for an effective advertising medium or just want to make your car look cool, you'll find that a wrapped vehicle is a sure way to turn heads any time you're driving around town building TOMA (Top Of The Mind Awareness)of your company or your favorite car! A wrap is a large vinyl graphic or decal that is applied over the original paint of the vehicle. 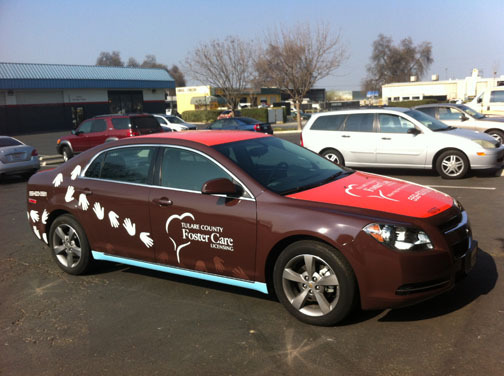 This form of vehicle advertising is popular in Visalia and throughout the entire world. What's the process involved in a wrapping a vehicle? Vehicle wraps are produced in four phases. The first is the design phase, which includes measuring and photographing the vehicle, designing and producing digital graphics, and creating printable files. The second is the production phase where the graphics are printed and laminated. The third is the detail cleaning with special products to remove all waxes and other contaminates from the surfaces to be wrapped to ensure a good install. The Fourth is installation where the printed vinyl is applied to the vehicle. In some cases there may be a fifth phase, which is the removal of the graphics if requested. What's the difference between a partial and a full wrap? Typically, a full wrap covers all the painted surfaces of the vehicle (excluding the roof on larger vehicles where it is not visible from the ground). Anything less than a full wrap is normally called a "partial wrap." A half wrap normally includes the entire rear, halfway up the sides of vehicle, and a hood logo. A three-quarter wrap normally includes the entire rear, the sides of the vehicle up to the front of the doors, and a hood logo. Under normal conditions, a wrap is expected to last between three to five years on vertical surfaces. The life of your wrap depends on a number of factors, including weather conditions, prolonged exposure to sunlight, and how you care for it. Although we have seen wraps go last much longer, they become very difficult to remove, and dated compared to your future marketing needs and goals. In most cases vehicle wraps will not damage factory paint jobs. Paint in poor condition, however, may peel when vinyl is removed. Yes. All vehicles must be free of dust, mud, wax, oil, Armor-All and other agents that may prevent the vinyl from adhering to the paint surface. We deep clean the surfaces before installation so you don’t need to wear yourself out. Just a basic wash to remove all dirt and road grime using a good detergent with no wax or sealers right before you bring the vehicle in. Production time of vehicle wraps will vary widely from project to project. Design can take between a few days to a few weeks. Print and installation generally takes two to three days. We will need your vehicle in the shop for installation between one to three days. If my vinyl vehicle wrap graphics are damaged, can they be fixed? Yes. You can normally have the damaged pieces or panels of your vehicle wrap replaced after your vehicle is repaired. You normally do not need to redo the entire wrap if the damage is limited to certain areas of the vehicle. You must always obtain permission to wrap a leased or rented vehicle. However, in general, most leased or rented vehicles have factory paint jobs with excellent paint quality. Vinyl applied over factory paint is best because the vinyl can be removed easier without damage or "paint peel." Leased vehicles are often wrapped throughout the country without incident or damage. Cost varies from vehicle to vehicle. There are several things to consider: design time, materials (including vinyl and lamination), print and installation. The size of the vehicle to be wrapped and the type of vehicle also play a part in cost. In general, vehicles with compound curves and indentations, such as a VW Beetle, the PT Cruiser, or some of the newer Sprinter Vans are more difficult and more expensive to wrap than a vehicle with more angular contours. Partial wraps are a great way to minimize cost as opposed to a full wrap. Cast (High performance) vinyl is more expensive then Calendared (Intermediate) vinyl but lasts longer, so be sure to ask for details. If you are using a vehicle wrap as signage, there is no more cost-effective advertising method available. It has been proven that the cost per impression (CPI) of vehicle wraps is far less than other forms of advertising such as billboards, television, radio and yellow pages. If you are using your vehicle wrap to improve the appearance of your vehicle, digitally printed vehicle wraps simply cannot be duplicated by more traditional methods like paint or airbrushing. Can you easily remove vinyl graphics used for wraps? Yes, in most cases. 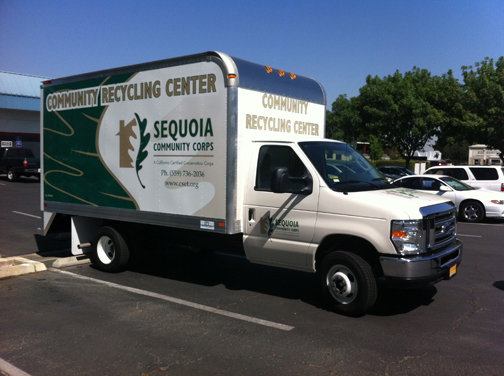 The vinyl used for vehicle wraps is designed to be removed with no residue. If the vehicle's paint is old or peeling, it might peel up with the vinyl when it is removed. Most top manufacturer’s warranty on OEM Paint in good condition the successful removal of the vinyl wrap. Ask us for details on the product being used on your vehicle. You can see through window graphics that are printed on perforated window material. This material is perforated with very small holes that allow you to see out. From inside the vehicle, visibility is similar. For safety reasons the front windshield and the front driver and passenger windows should not have vinyl graphics. Normally the rear window and the passenger and driver side rear windows can be covered. The printable vinyl vehicle wrap material is completely opaque, so paint is not visible through the material. However, the vehicle's base color will be visible in the cracks and other unwrapped areas, such as for example in the grill or under the door handles. Some color change and custom patterned wrap vinyl’s are not opaque and the underlying color will affect the way it looks. Which surfaces of my vehicle can be wrapped? The adhesive on our vehicle wrap material is designed to stick to the slick painted surfaces of vehicles without damaging factory paint when removed. The adhesive doesn't stick as well to porous surfaces, such as plastics or rubber trims. This should be taken into consideration when laying out your graphics.